Warning: This robot is dangerous. Before building one, think. Before operating one, think some more. Please. Because mowing many acres is time consuming. And because it's a good test-bed for other agricultural machines. The mowing deck could be replaced with other things - a bucket to carry tools / rocks / weeds / spray tool / weeding instrument, a camera .. etc. 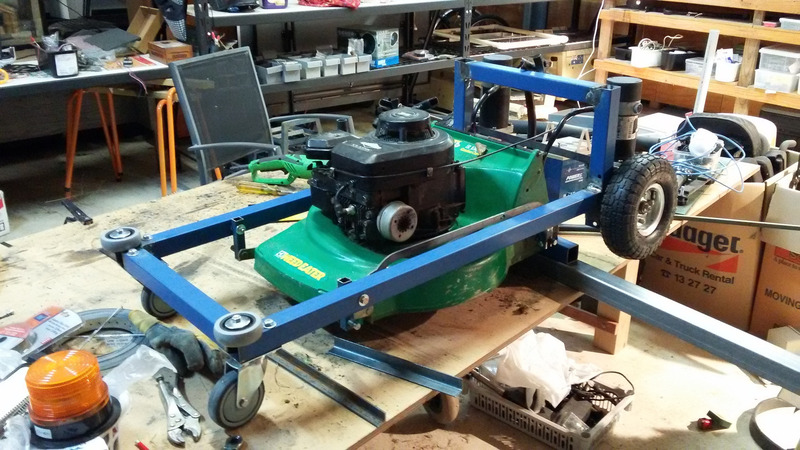 Well .. it seemed like a good idea at the time, but a manual reel mower this is actually a very inefficient solution. 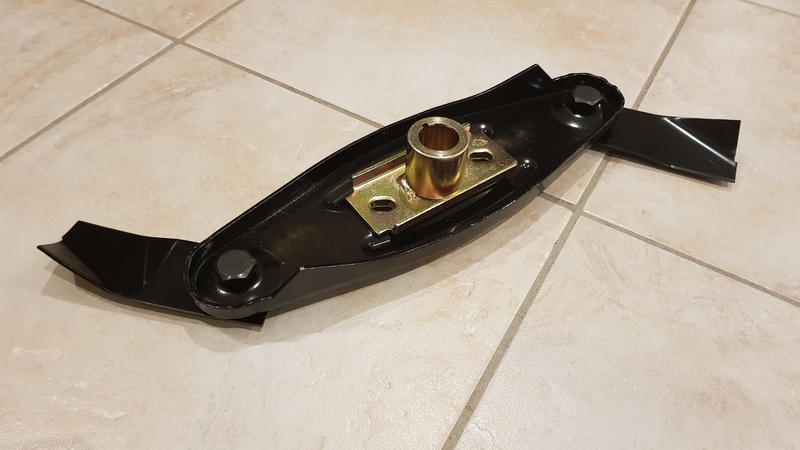 Particularly as it would put considerable strain on the gearboxes of the motors. 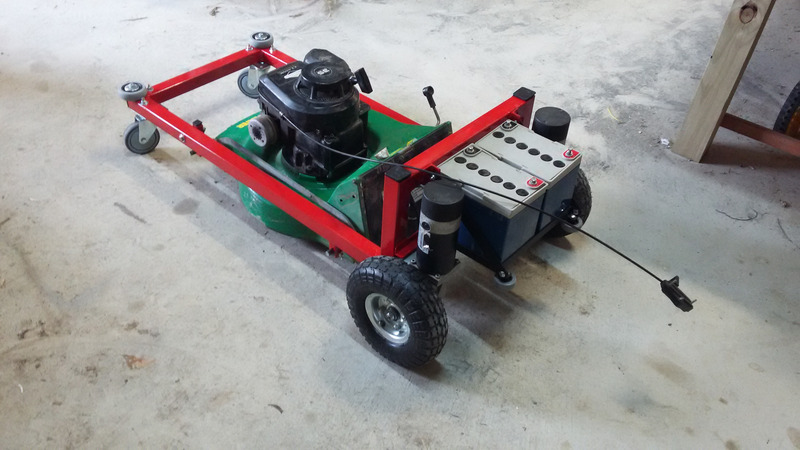 A rotary mower is a better solution- it won't put as much stress and strain on the gearbox. 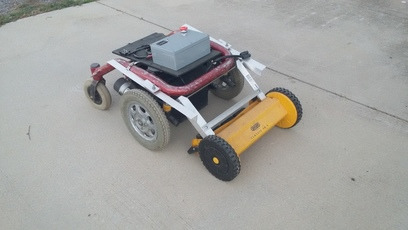 This one is a battery operated electric rotary mower. These are easier to use with a robot than a petrol-powered mower. 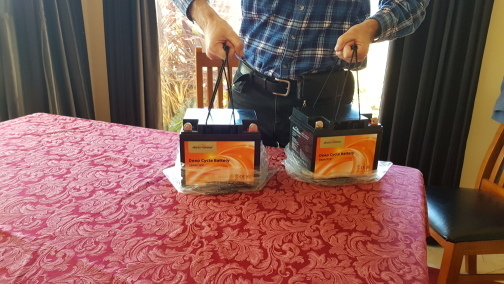 They run on batteries already, and could even share the batteries with the drive mechanism. They are generally lighter, and hence easier to work with. 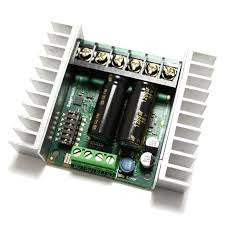 They can be turned on and off with a relay, and are therefore easier to fully automate. 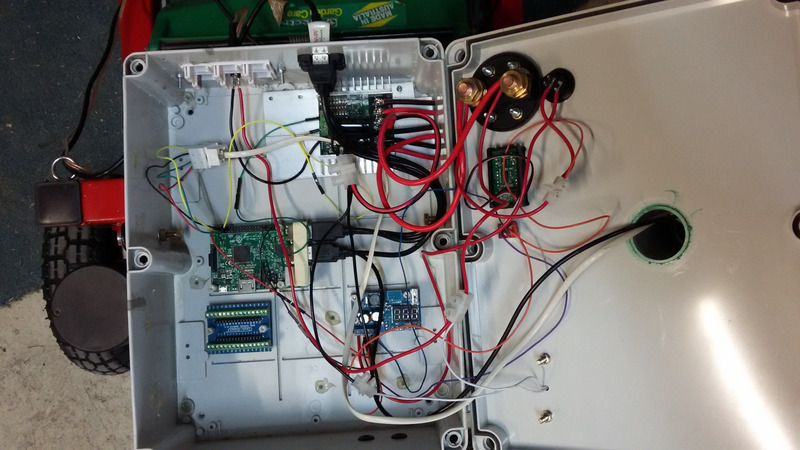 The controller can monitor the motor current to detect stalling, near-stalling, or thermal cut-out. But there are also disadvantages of a battery mower. They are not good at getting through thick grass. 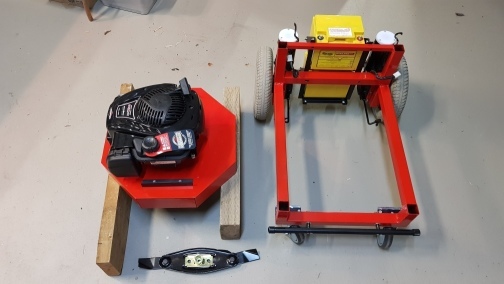 A decision was made to make a frame large enough to mount either a battery or petrol powered mower to allow experimentation with both. One of the issues with a standard push mower is stalling. 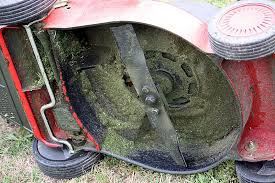 If you hit a thick clump of vegetation, the mower is prone to stall. A human operator will intuitively either lift (tilt) the mower or reverse it to prevent the stall. 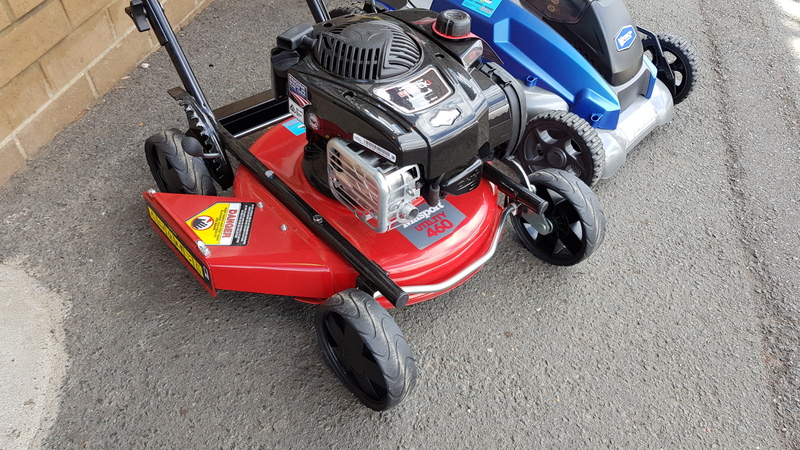 Further, a human operator tends to adapt the speed of pushing the mower according to the toughness of the vegetation - the mower gets pushed more slowly through the thicker grass. Many modern mowers reduce the need for this process in several ways. Firstly they have a governor, which effectively tries to keep the motor at constant speed. It's like an auto-throttle which revs the engine when it starts to slow down. Secondly, they use swing blades mounted on a disk, instead of the 'rotating machetes' model. With swing blades, only a small amount of grass is actually being cut at a time. 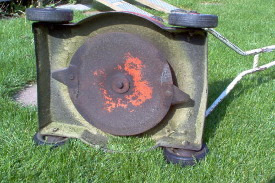 Too much grass, and the blades get pushed back (though the are unlikely to in the photographed example because they are so badly rusted). 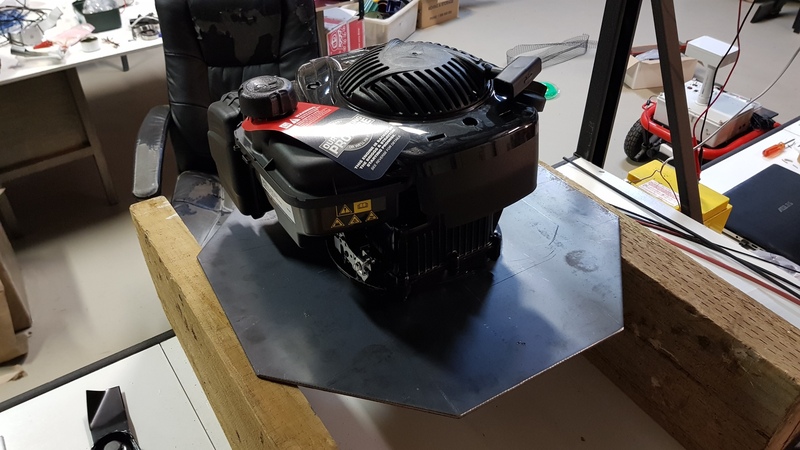 This might reduce the quality of the cut, but it means the motor is less prone to stalling. This is both good and bad news for a robot mower - it may not stall, but the robot won't get good feedback to enable it to slow down on thick grass to get a good cut. A servo-controlled throttle could be installed, but it would have to interact with the governor in subtle ways (or the governor would have to be removed). This would be a good reason to monitor the RPM of the engine. 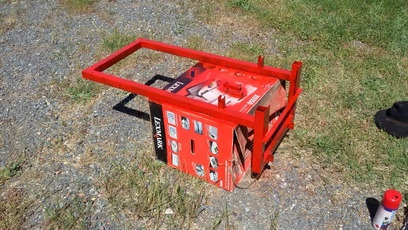 Box EBay A box. A big box. Always use a bigger box. Jaycar don't stock good boxes this size, and ordering them online is almost as much as buying locally because of the size. Raspberry Pi-3 Core Electronics The brain of the rover. 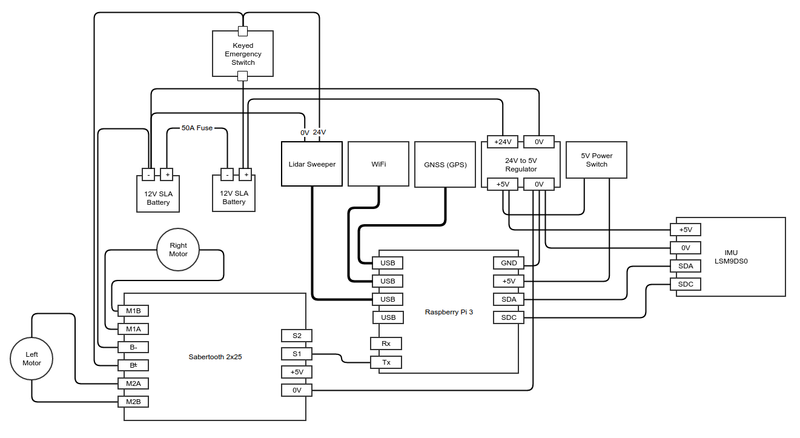 Step-down Power Supply EBay To (back-)power the Raspberry Pi. Don't use one of these, they are not reliable. Use a proper automotive one. 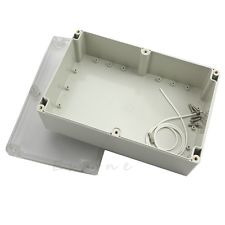 WiFi Dongle EBay For communicating with WiFi network (including the RTKLIB base station). Warning Strobe EBay Robots are dangerous. Warn people about this. 50A Anderson Plugs EBay May be required to connect battery or drive motors. Cheap when bought in bulk. Pneumatic Wheels Bunnings Far better than the ones which came with the wheelchair. 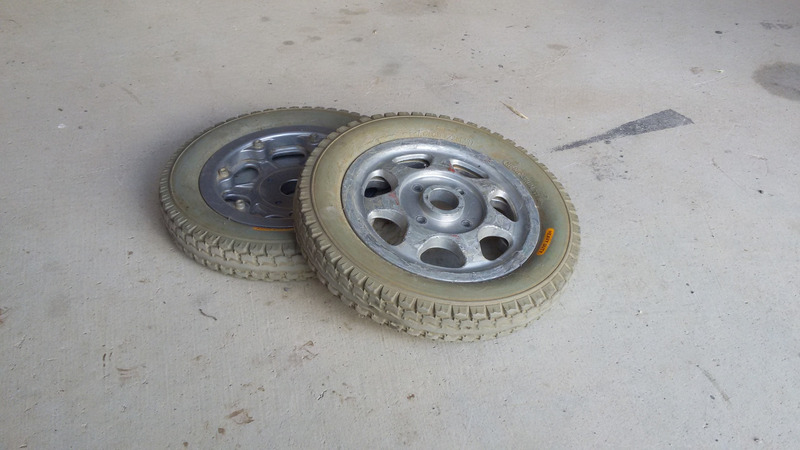 I had to take out the centres of these with an angle grinder and a vice. In the end they fit pretty well. Some people complain that these cheap tubes don't hold pressure, but I haven't had any problem. Most of the paraphernalia which comes with an electric wheelchair is useless unfortunately. 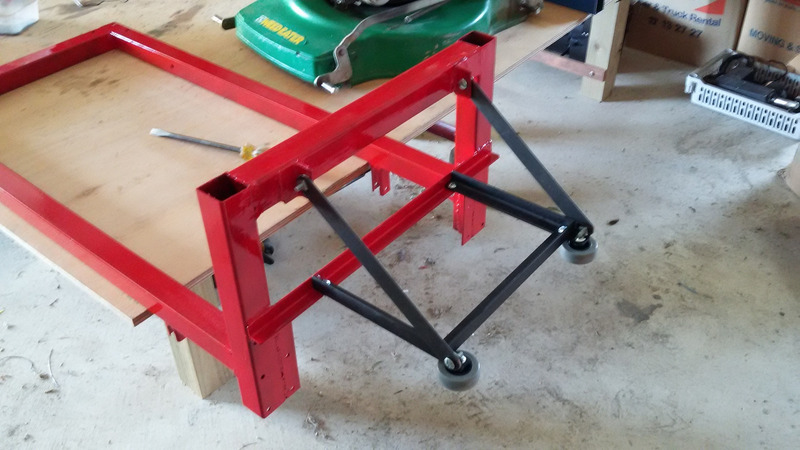 The only parts of the chair that were re-used for this project were the motors (including the gearboxes and axles), and the batteries. 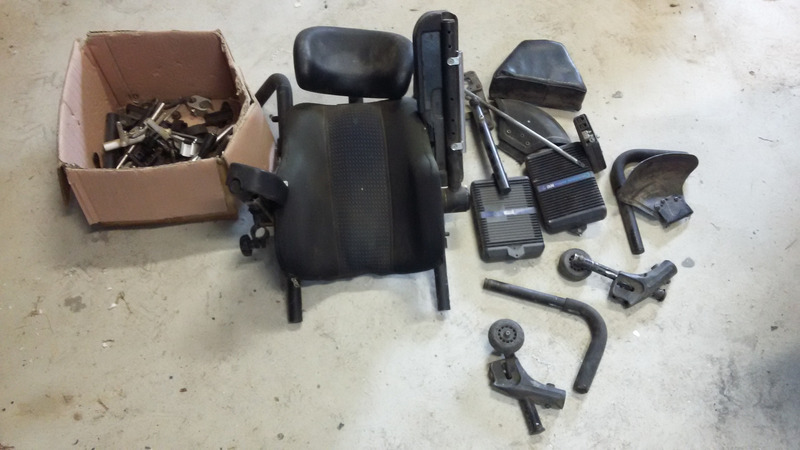 Disassemble any human-interface components on the chair. Photograph the model numbers on the motors and batteries in case the labels are damaged or made illegible in the clean-up, or any subsequent trauma. 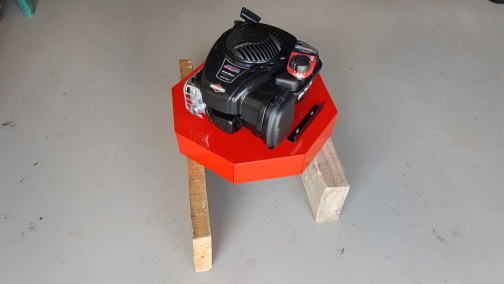 Work out how to get power to the Sabertooth 2x25 from the batteries, and to the motors. 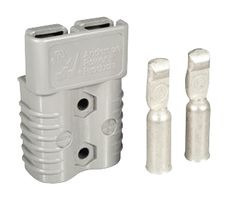 Anderson plugs are good, but there are many others too. This may mean cutting the existing wires (from the battery and to the motors) and soldering the plugs. The standard wheels were too big and too narrow, and not pneumatic. 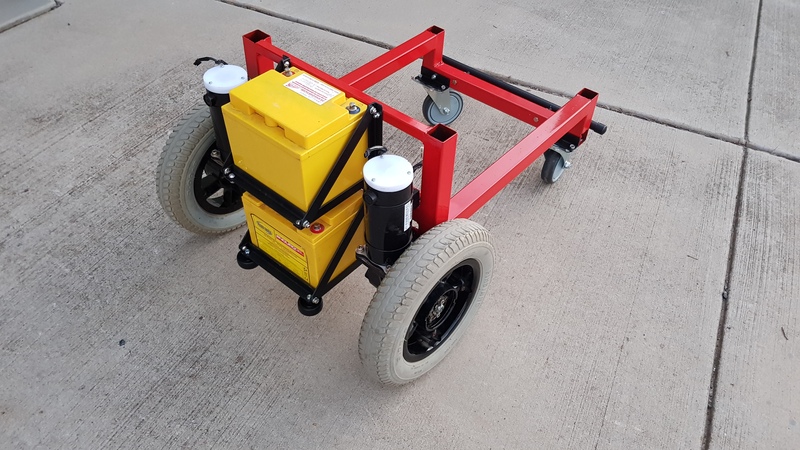 Replaced with small pneumatic wheels. Some wheelchairs actually have water-resistant battery cases for the batteries. 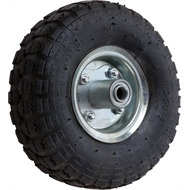 These are great for rough or wet terrain. Unfortunately They are also sometimes hard to fit into the available space. 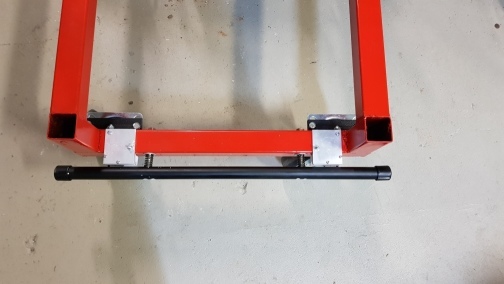 This one mounts well on two elongated tubes, but the tubes have an unusual cross-section, which is hard to come by. You will need some box metal and a welder. 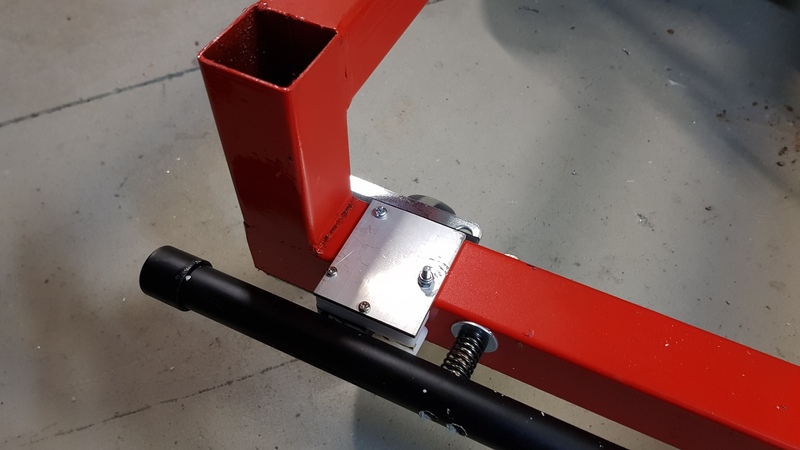 40mm box is pretty good for the frame of a mower. .. welded and the mower seems to fit. Painted red. Robots are dangerous. They should be red. A red strobe light is a good idea too. 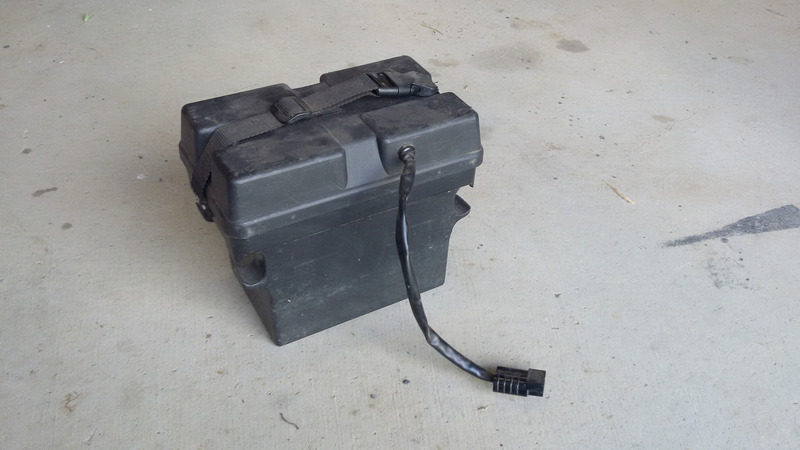 Backpack for the battery. 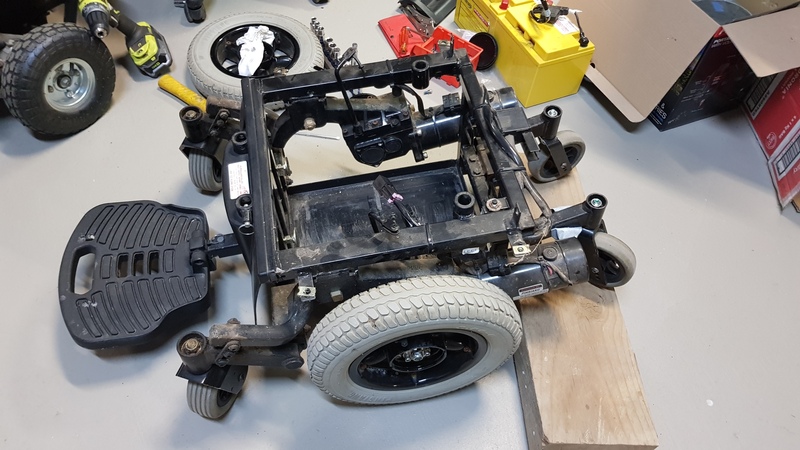 The batteries are the heaviest part of the rover, and putting them in a back-pack will partially counter-balance the weight of the mower. The horizontal wheels are for collision mitigation. Motors attached. 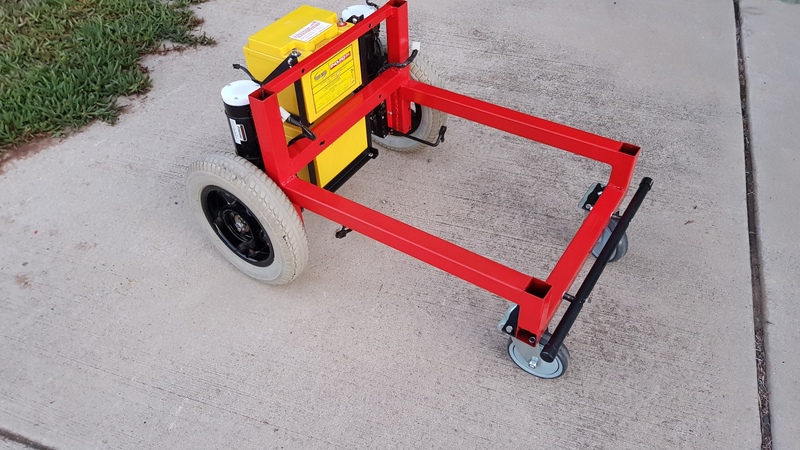 Note the $11 pneumatic wheels from Bunnings - better in so many ways. These will increase traction and leverage and decrease vibration. 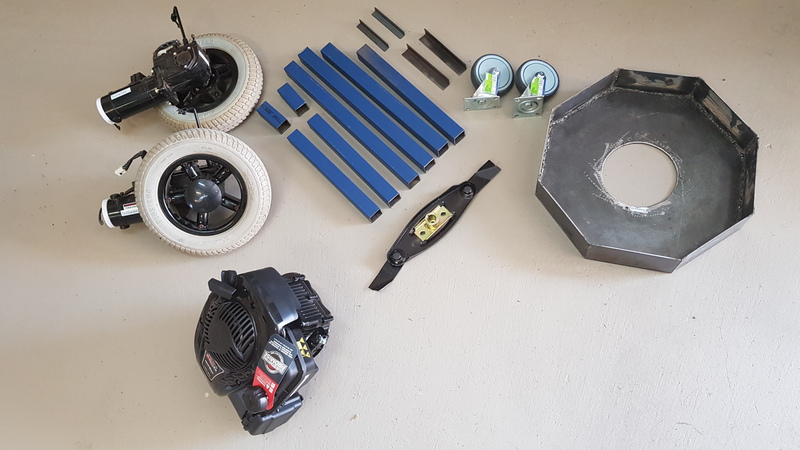 Mower remounted and batteries in the backpack. 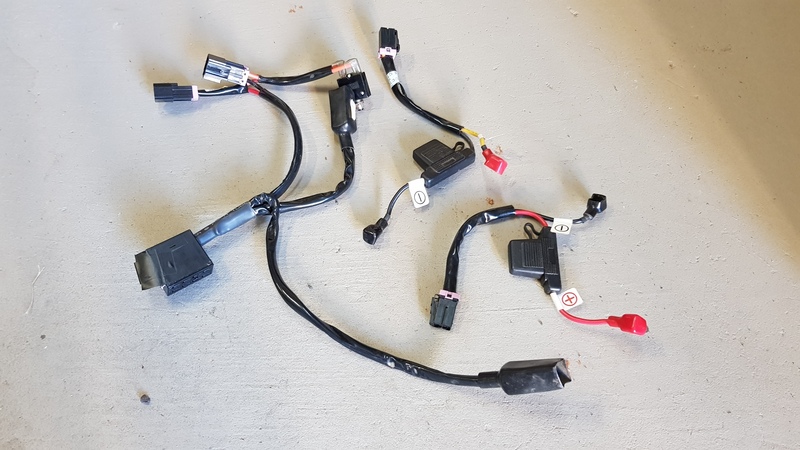 Not sure where to run the throttle cable. 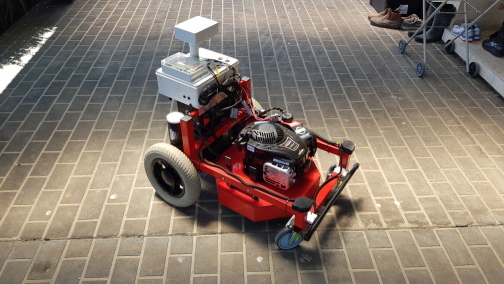 A custom mowing deck, which allows the rover to be shorter and more manoeuvrable. 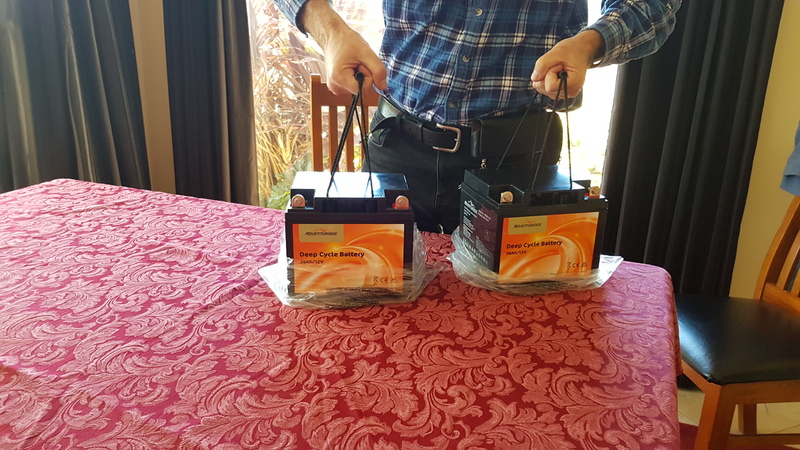 Aldi had a special on deep-cycle batteries. Got up early and fought my way through the blue-rinse bargain hunters to pick up a pair of these. The engine on the octagonal plate. 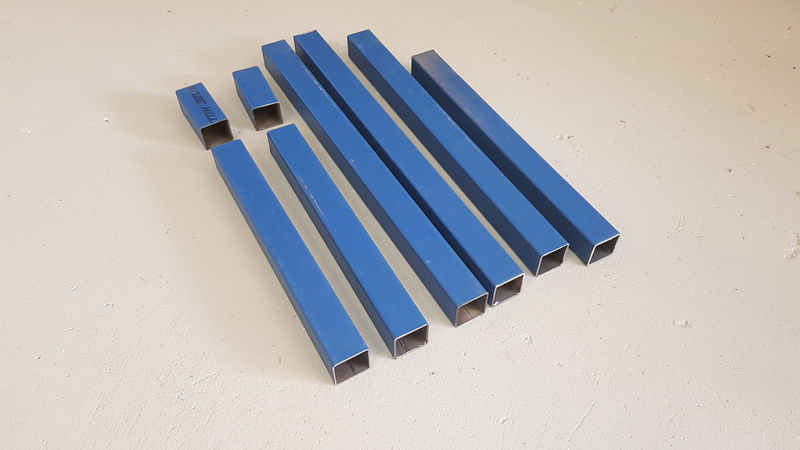 The blades - swing blades for a better cut and robust blade behaviour. 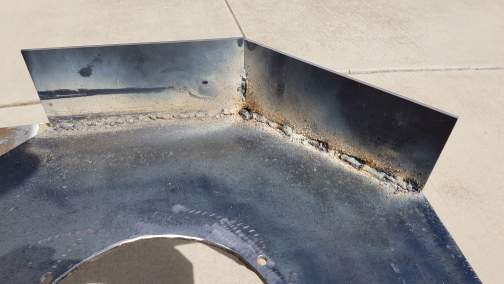 Welding the skirt onto the plate. 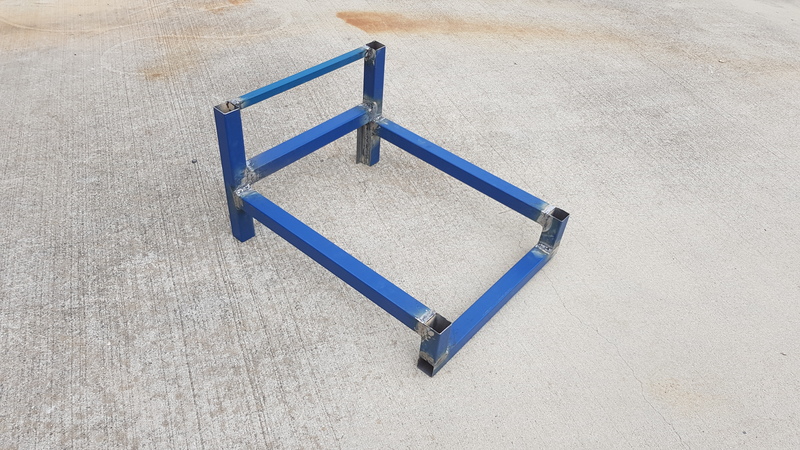 Bunning's cheapest dodgiest welder, and the welding skills to match. 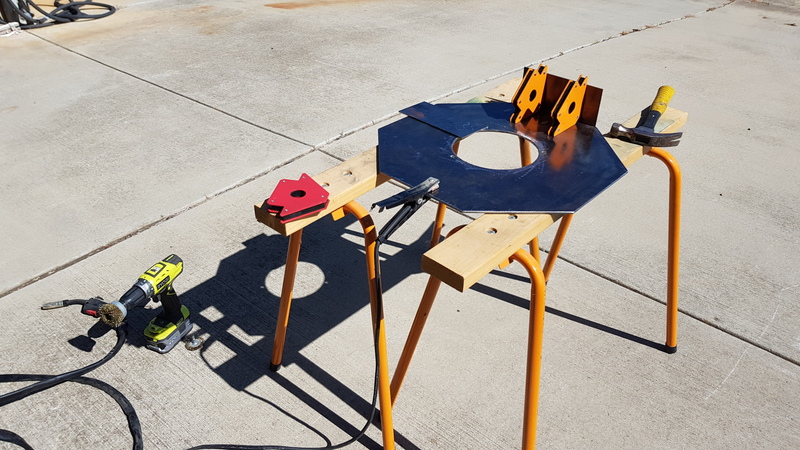 Welding doesn't have to be good, just done with lots of redundancy. 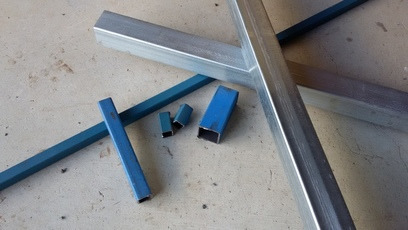 40mm square steel tube for the rover frame. 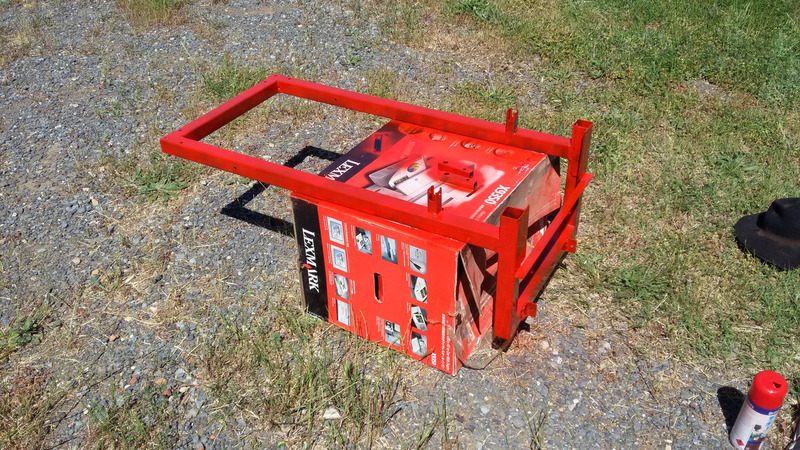 This seems like overkill, but (with 'challenged' welding ability) provides redundancy. Also, it's much easier to drill into later for mounting things on. 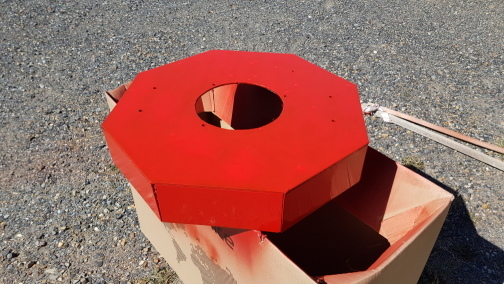 You can drill a lot of holes in 40mm box without compromising integrity. 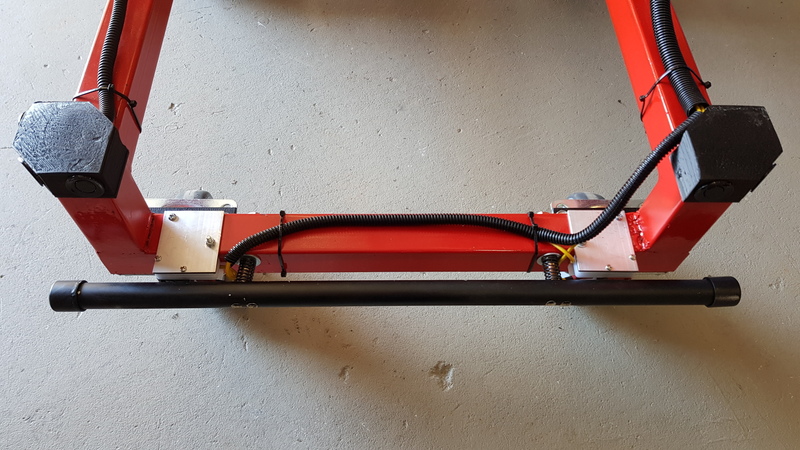 The collision detection bar is mounted no the front of the rover - no switches yet. The original wiring loom from the wheelchair can be re-used. The Davrover control box can be reused as the test-control box. 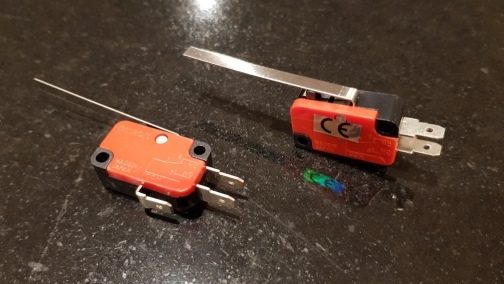 These micro-switches are good for collision detection. The lever and the 'normally off' terminal can be removed, and mounted between layers of CNCed acrylic. The 'nib' (ie the actual press part of the switch) is just sticking out the front of these assemblies. The top plate should have been CNCed too, but CNCing aluminium is harder than acrylic. Yes, that is a broken milling bit stuck in melted aluminium. It was kind of spectacular. 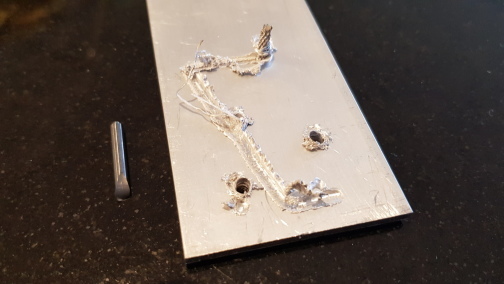 I might leave Aluminium CNCing to the real professionals. The bumper switch mechanism mounted to the front of the robot. If the rover hits anything, the black bumpers will spring back and press the (normally ON) switches. Hopefully the black plastic pipe is soft enough to bend or break before anything else, so the collision will be mitigated as well as detected. The switches have also been placed so that even if one side of the bumper is caught and pulled, the opposite switch will still activate, and a collision will still be detected. Walking past a lawn mower shop and this little gem greets me. I could have just purchased this lawn mower and reused the engine, blade assembly and deck, and thrown away wheels, handle and wheel mount brackets. 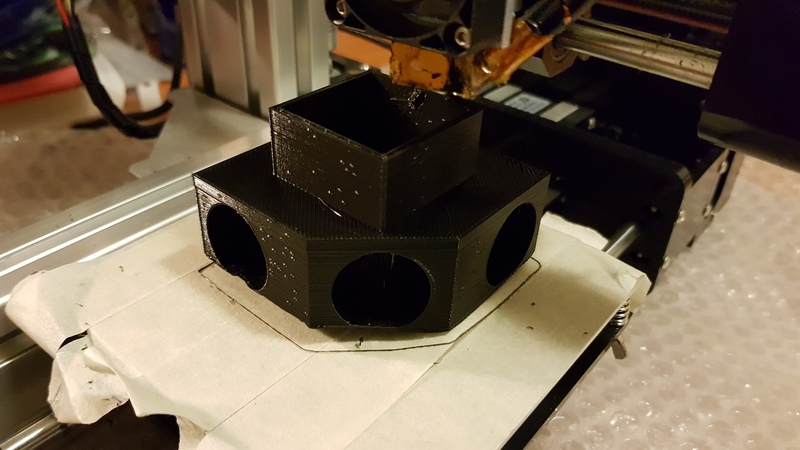 Printing a variation of the parking sensor mount which fits into 40x40x1.6mm steel square tube. Yes, the bottom (well, top) of the sensor is peeling off the bed. 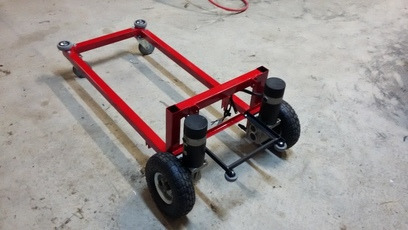 Mounted on the rover with the looming done. All present, right, diagonal and centre. The B&S engine is still untested, but needs to be fitted for testing to provide balance - otherwise the batteries on the back-pack will cause it to overturn. Yes, the control box is held on with rope here. It was a test. This is the same as the circuit diagram for the Davrover. Doesn't show the voltmeter to check voltages, or the red flashing strobe light. 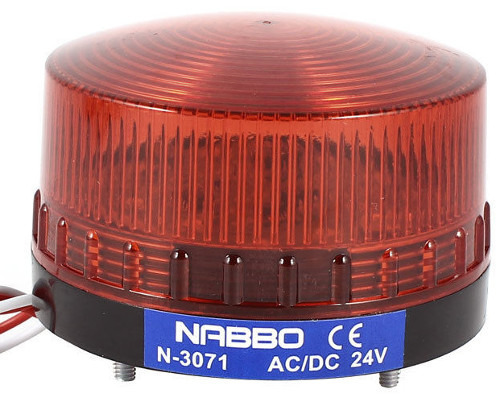 Flashing red light - this is always on when the 24V components are powered. 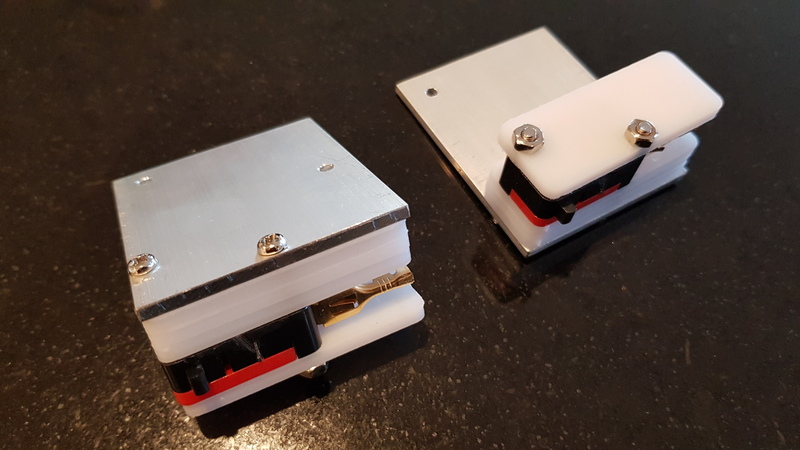 Big on/off keyed switch - high current 24V. 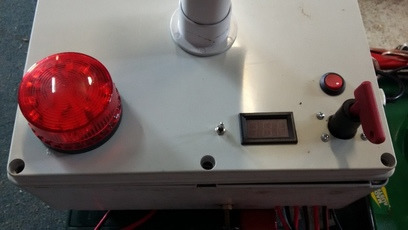 This is both a safety switch (with a removable key), and an emergency stop. 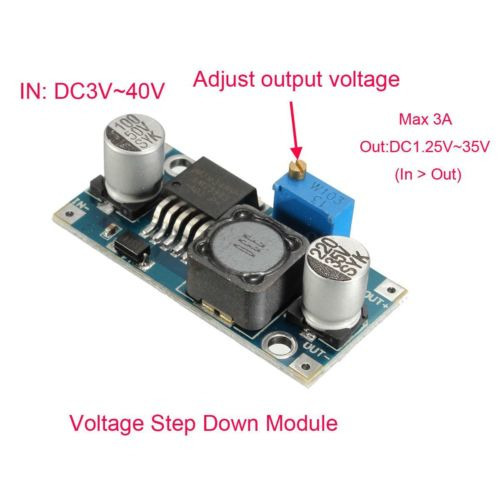 Switch-mode transformer 24V to 5V (this has a built-in voltmeter which is not visible when the box is closed). 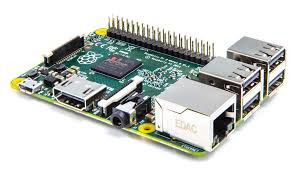 Note that this powers the Raspberry Pi directly through the GPIO. The Raspberry Pi has no over-voltage protection in this mode. Socket mount for Arduino Nano (not yet actually fitted). This will handle collision detection sensor switches, RPM motor measure, current sensor for electric mower. 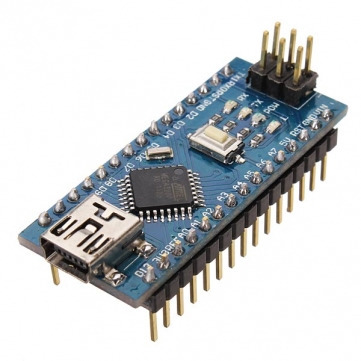 The Sabertooth 2x25 motor controller. 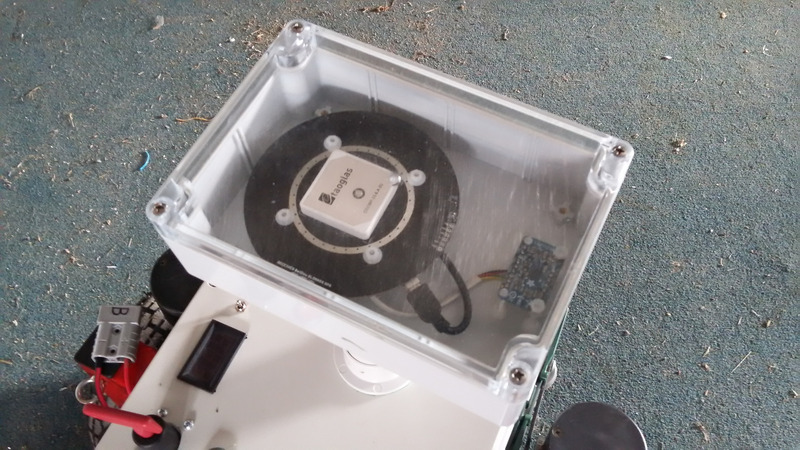 This has been mounted on some flat aluminium with thermally conductive paste to help cooling. 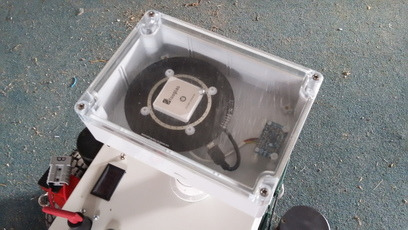 The GNSS (GPS) and the LSM9DS0 IMU may need to be separated from the rest of the componentry and the metal of the rover base. The metal, in particular, affects the magnetometer. They placed in an elevated plastic box on a mast made from PVC plumbing pipe and appropriate joiners. 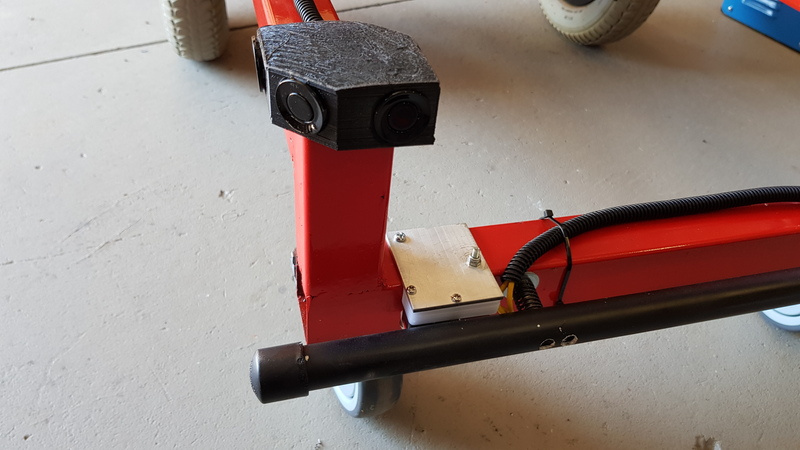 Unfortunately the mast compromises the design: The LidarLiteSweeper should be both as low as possible (to detect low obstacles), but be the highest point of the rover to get a 360° view. The mast will get in the way of the scanning, and will probably require software programming to remove it from view. This will create a blind-spot. If the mast is behind the LidarLiteSweeper, and least the blind spot will be behind the rover and not in front. However it does force a directionality into the rover, which in principle could be orientation-agnostic. Consider, for instance a rover pushing a manual reel mower (one of those old ones which powers the blades from being pushed by the operator). It would run forwards to mow grass, but backwards when moving to position, returning to be recharged etc. Orientation-agnosticism would be important there. There are many compromises in design here: too high, and the mast will be caught on bush or tree branches; too low and the magnetometer will be affected by the metal in the rover. Everything wants to be as low as possible, but higher than everything else. 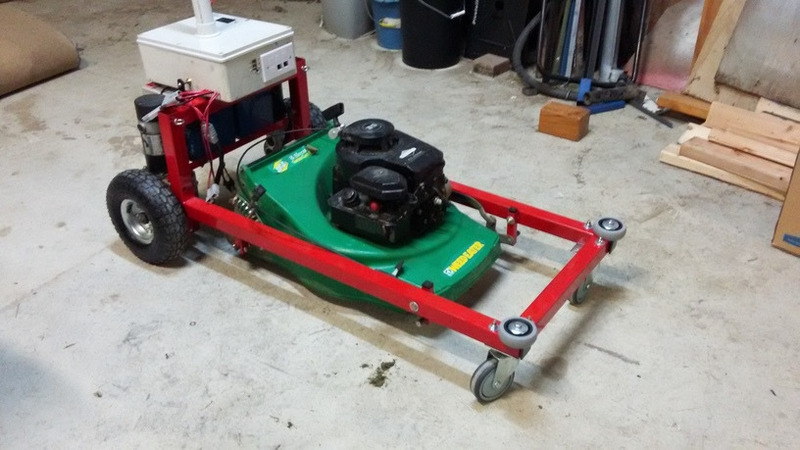 Animation showing the lawn mowing concept. This is a mowing simulation using the 'stake dropping algorithm'. A left-wall hugging rover drops (virtual) stakes as it moves around, and hence knows where it has mown. The rover here is the red rectangle, which has gotten stuck in a local island towards the north east. 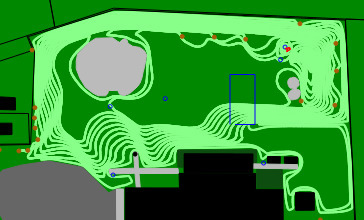 This is a mowing simulation following a set path, but with obstacle avoidance. It gets through. Integrating the RPM measurement mechanism. 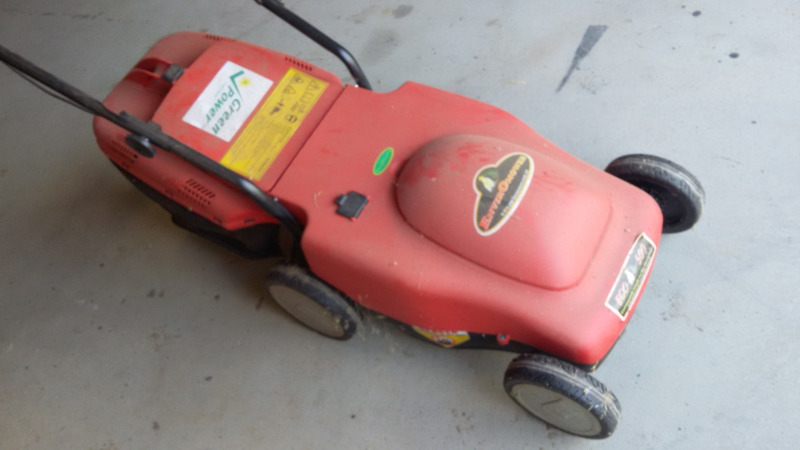 To detect when the mower should slow down because it has hit a thick clump of vegetation. 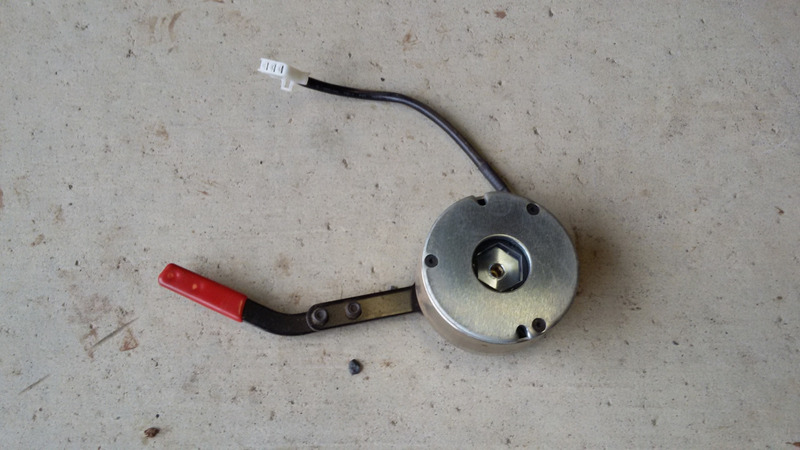 Throttle control - replacing the governor on the mower with a servo control. This would allow better detection of when the engine was struggling with the vegetation, and when to slow the mower. 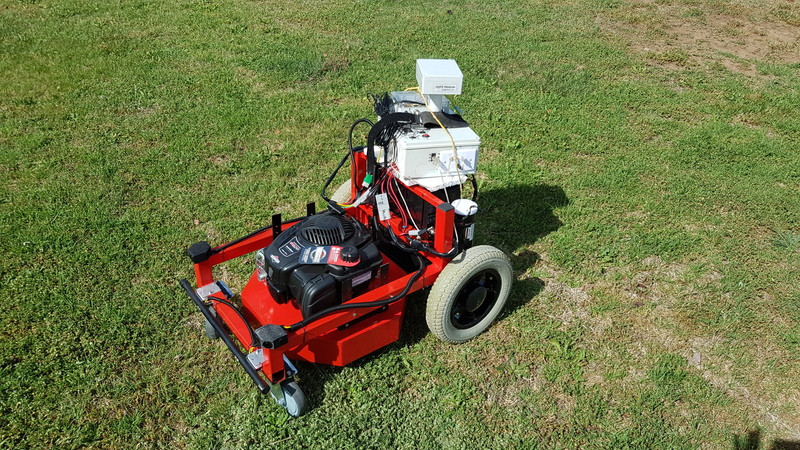 Non mowing applications - replacing the mower with other agricultural equipment - weed detection, weed removal, spray boom etc. 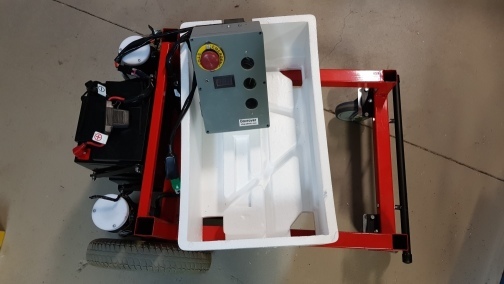 Other agricultural uses - replacing the mower deck with other agricultural equipment - weed detection, weed removal, spray boom etc.